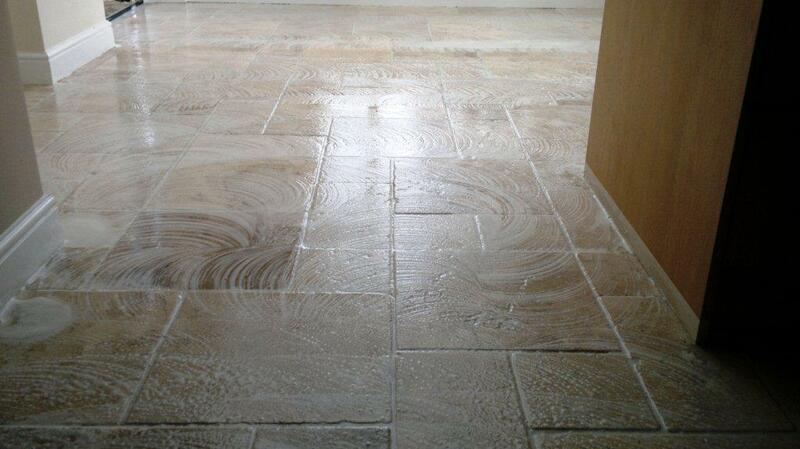 Travertine is a beautiful natural material which due to its hardness makes a fantastic flooring material. To get the best out of it though it does need to be polished as it does dull over time depending of the amount of wear it receives. 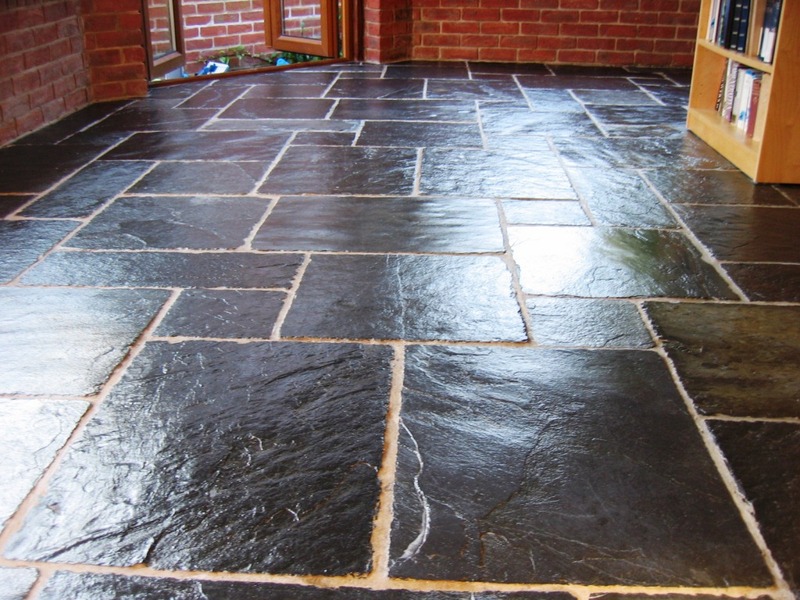 I also recommend sealing it as well as this will protect the stone from staining and if you have the right sealer it can enhance the look of the stone even further. 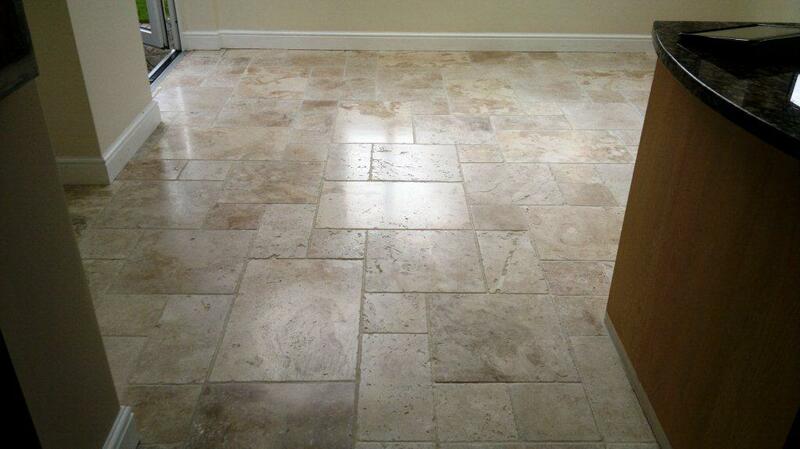 This Travertine tiled floor in Fareham was due a polish so I gave the floor a quick clean using Tile Doctor Pro-Clean paying particular attention to the grout with a stiff grout brush. 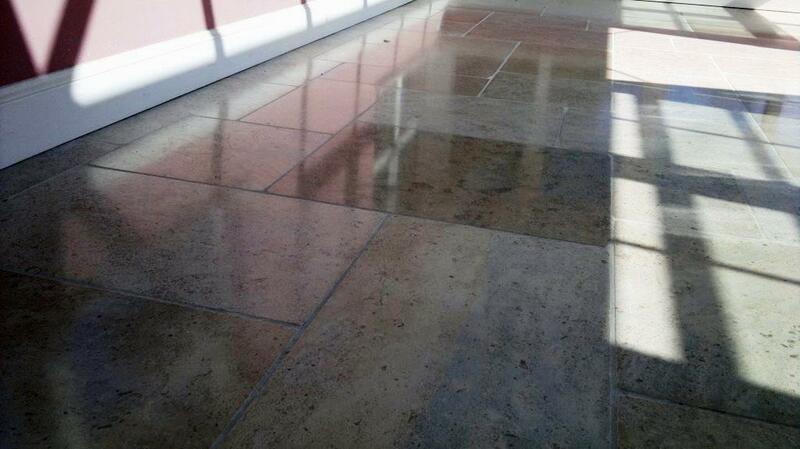 The dirty solution was then removed using a wet vacuum and I moved onto burnishing the Travertine to bring up the polish. 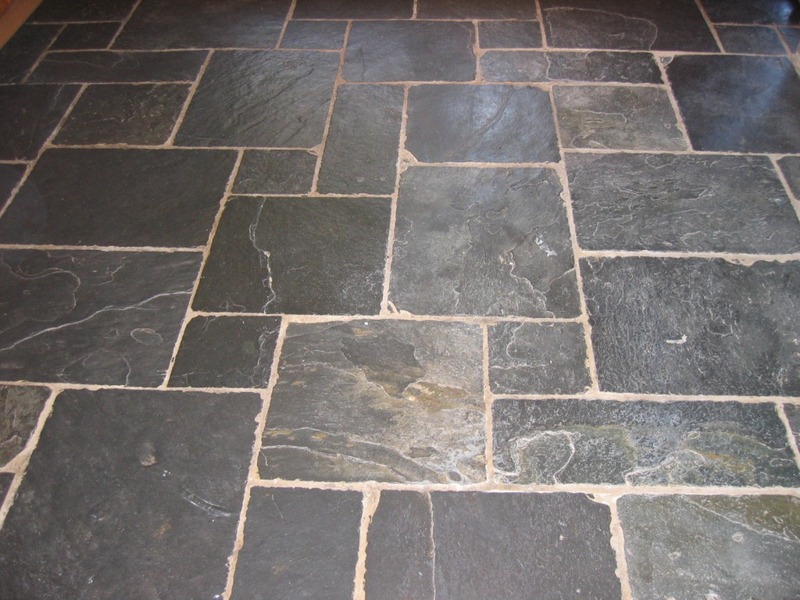 Burnishing requires a set of four diamond encrusted pads with different grits from coarse to extra fine and are applied to the floor using a little water to help lubricate the process. 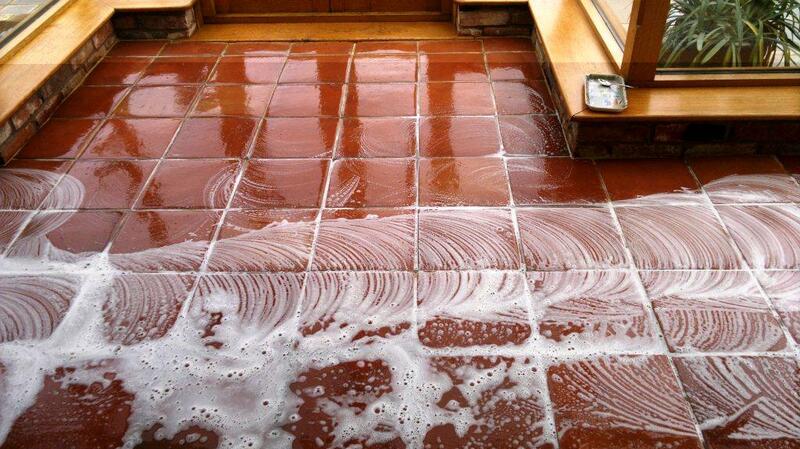 It’s also necessary to rinse the floor between each pad to remove the slurry that is generated in the process. Burnishing took most of the day so once finished I give the floor a final rinse and left it to dry off overnight. 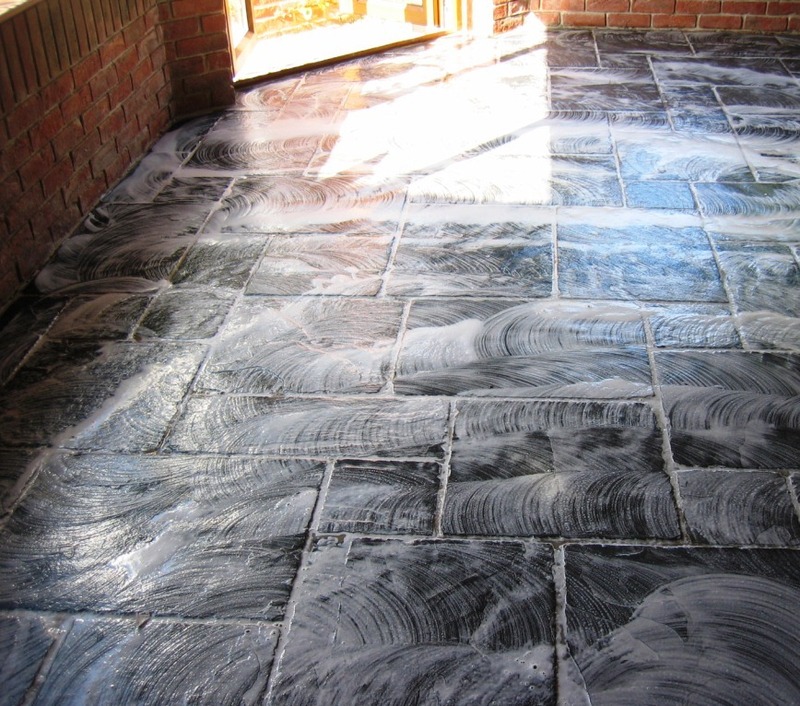 I came back to seal the floor the next day using two coats of Tile Doctor Colour Grow which is an impregnating sealer that soaks into the pores of the stone providing protection from within the stone and also enhancing the natural colours of the stone. On reflection I can see I probably should of taken more photographs of this floor, hopefully you can appreciate the difference which was quite remarkable. 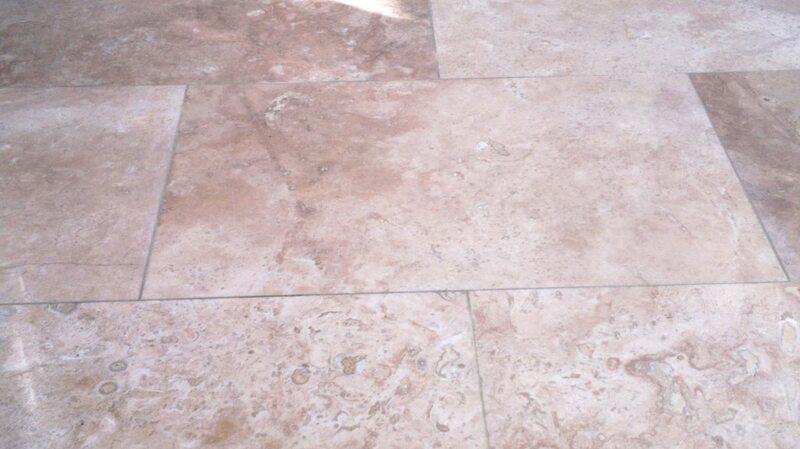 I do like a beautiful Travertine Tiled floor however they do need regular maintenance to keep them looking good. 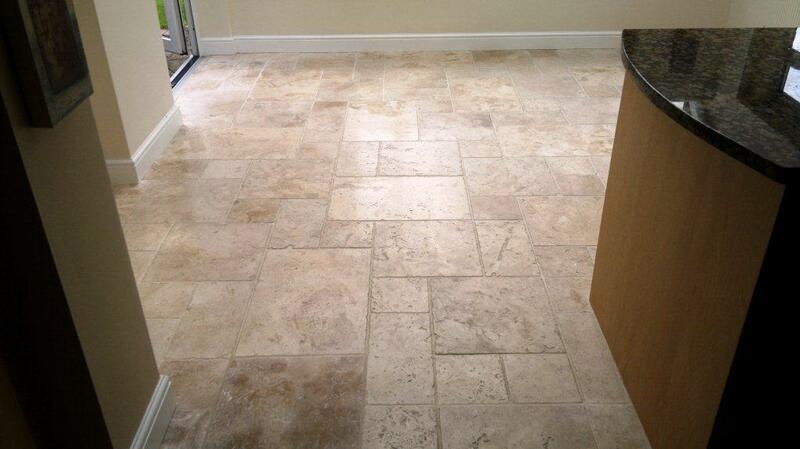 This travertine floor installed in the kitchen of a house in Fareham was no different as the tiles were looking dull and the grout was tarnishing. To protect the kitchen units from water a protective tape was applied around the base and once done we gave the tiles a quick clean using Tile Doctor Pro-Clean working it in with a scrubbing pad fitted to a rotary machine and then into the grout lines with a stiff hand brush. 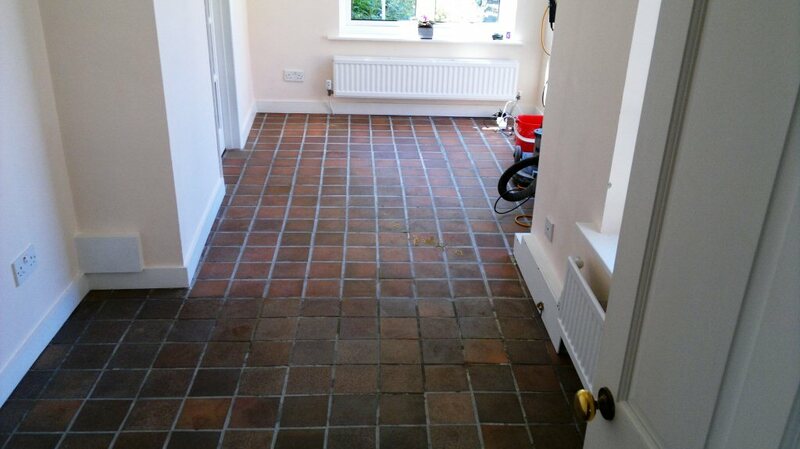 The dirty solution was then removed using a wet vacuum and we moved onto burnishing the whole tiled floor. We stated the burnishing process with a red fitted to a rotary machine with a little water. 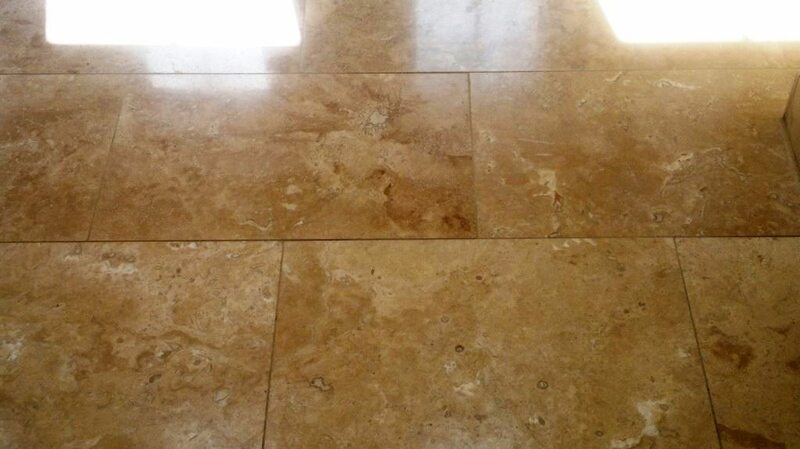 The burnishing pads are encrusted with diamonds and are very good at removing dirt and sealers from hard stone including Travertine and Marble; the surface water and loose dirt was removed used a wet Vacuum. There are four pads in the burnishing system and they are applied to the stone floor in sequence starting with a course pad with a little water and then moving onto the finer polishing pads one after the other until we were left with a high shine finish. We left the floor to dry overnight and came back the next day to seal the floor. 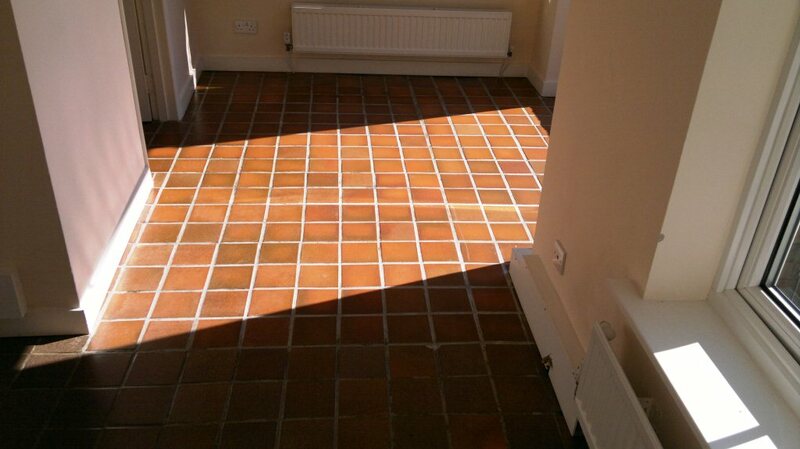 The floor must be dry before sealing otherwise the results can be unpredictable. 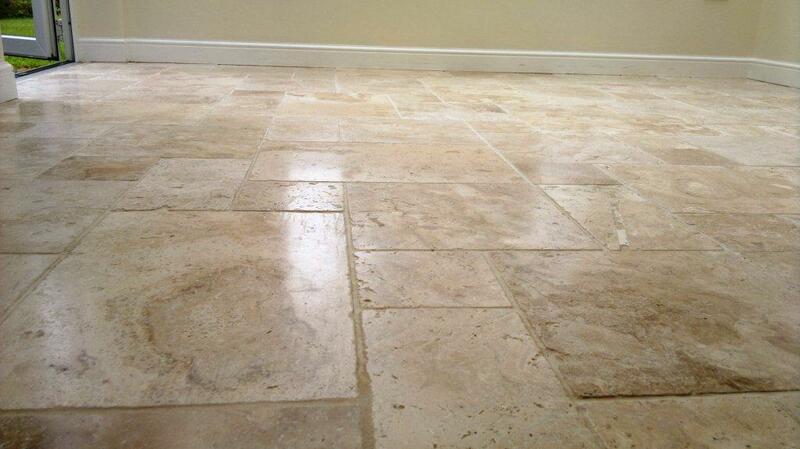 Once we were happy the floor was dry we proceeded to seal the Travertine tile using two coats of Tile Doctor Colour Ultra-Seal which provides a natural look to the stone as well providing excellent stain protection. 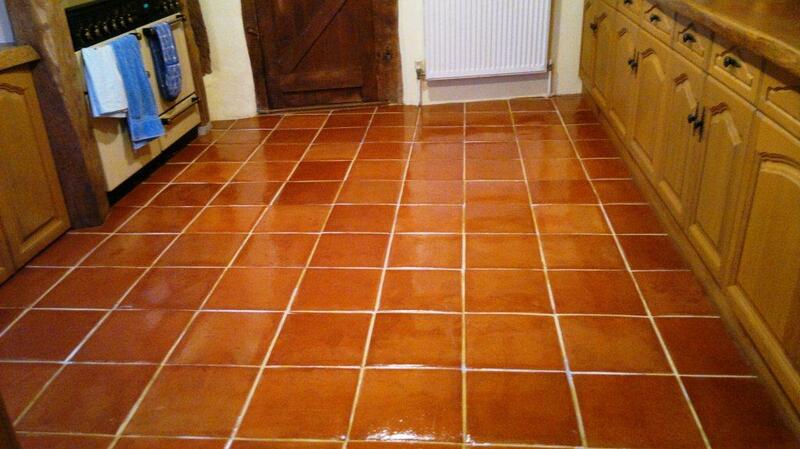 Two coats of sealer were sufficient to seal the floor. 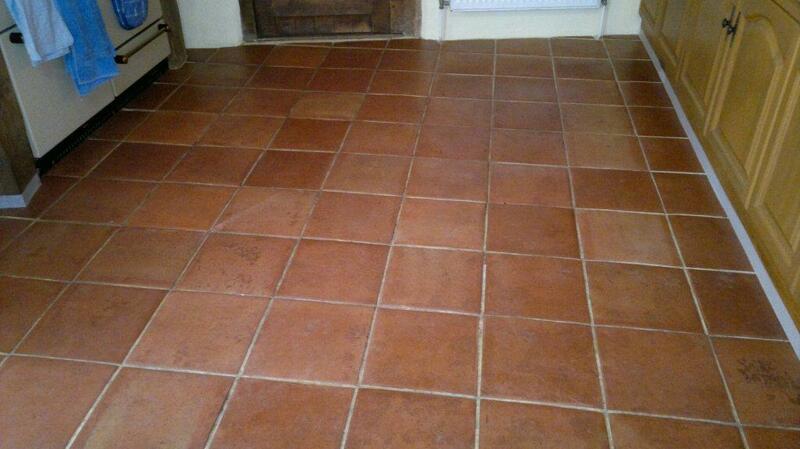 Details below of a Quarry Tiled kitchen floor that were cleaned and sealed for a customer in Fareham. 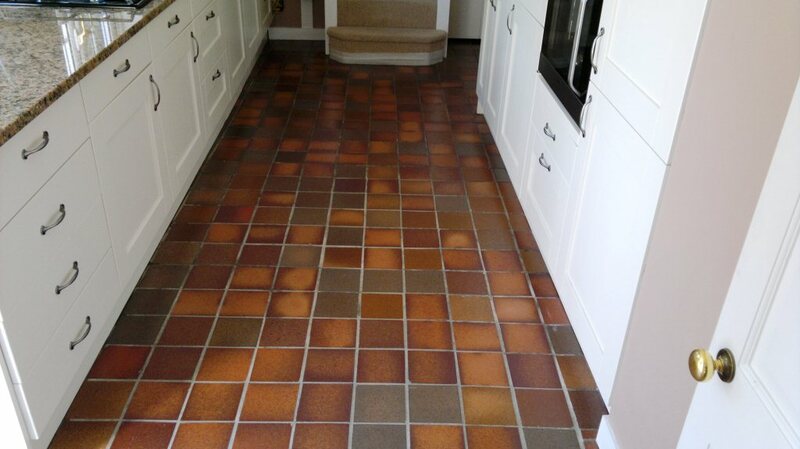 The main problems were that the tiles were becoming increasingly difficult to clean so they looked dull and tired and the grout had become stained. 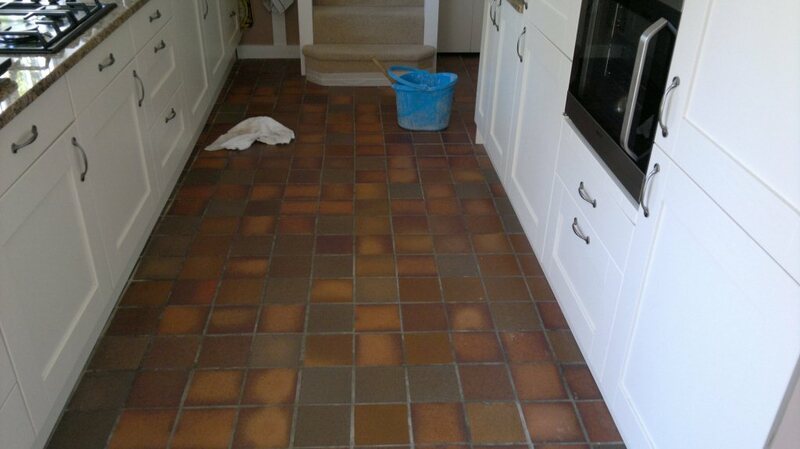 A solution of Tile Doctor Pro-Clean was applied to the floor and left to soak for a short while before being scrubbed in with a rotary machine fitted with a black scrubbing pad. The grout was also in need of attention and this had to be scrubbed by hand using a stiff brush along the grout lines, which as you can imagine took some time. The soiled cleaning solution was then removed using a wet vacuum and the floor thoroughly rinsed with water and then left to dry overnight. When we returned the next day we could see there were a few areas in need of some further attention so we set about cleaning those up. 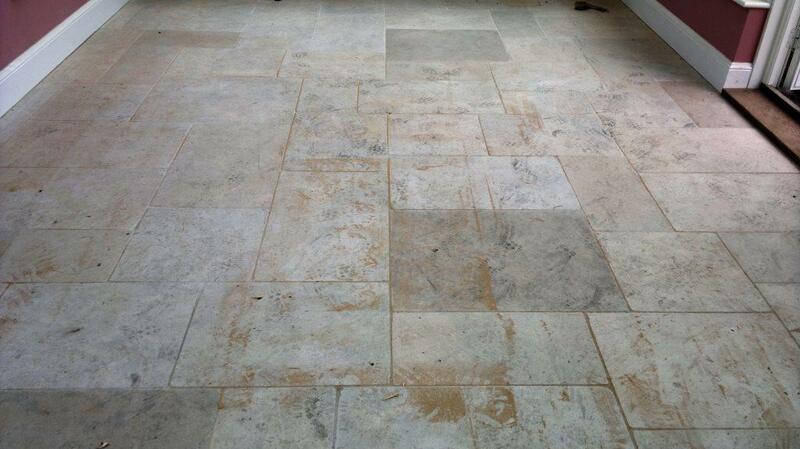 Once we were happy with the floor and it had managed to dry off we sealed the floor using six coats of Tile Doctor Seal and Go which is a water based sealer (so no smell) that provides surface stain protection to the quarry tile and grout and also leaves a nice deep low sheen on the tile surface.